You don't have to like football to enjoy tailgating! What is more fun than sharing good food with good friends? 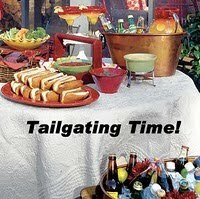 Join us for week #7 of Tailgating Time, it's easy, just add your link! It's all about the food!! This is a healthier version of chicken tenders, since they are baked not fried. Of course you can pan fry them and they turn out just as good. In a zip top bag dust the chicken in some flour, tapping off the excess flour. Then using two flat shaped bowls or pie tins and lightly beat 1 egg with about 1 Tablespoon deli mustard (you can use Dijon). In the other bowl or pie tin, I used half and half bread crumbs and Parmesan cheese (sometimes more parm). Season the bread crumbs with salt and pepper and whatever seasoning you like. I used grill seasoning on mine. Dip the chicken in the egg/mustard mixture then lay it into the Parmesan mix lightly pressing into the crumbs. Use one hand in the egg so the other will stay dry. Place the breaded tender onto a baking sheet with parchment paper. I always use my stoneware for this. I have a large bar pan that works great. With the stoneware you don't have to grease it or turn the tenders to brown them. Spray the tops with cooking spray or I sprinkled with a little olive oil over each one (just a touch). Bake at 375 degrees for 25-30 minutes until chicken is done and it's golden brown. Don't forget to bring along your favorite dipping sauce, whether it's BBQ, honey dijon, ranch, or chipotle/mayo...the list goes on...what do you dip your chicken tenders in? Or are you a no-dipper? Tailgating Time will be posted every Sunday at noon and there is a change this week. It will be open until noon on Wednesday. That should still give you plenty of time to add your family favorites. We'll play each and every week until Superbowl Sunday. They look delicious! Perfect recipe for a weekend get together. Hi Lyndsey, I'm bringing pie to the party this week. I love chicken tenders, yours look incredibly crispy and tasty. I'm a ranch dressing person. I even dip my pizza in ranch (I know, I'm weird) so definitely ranch dip for my chicken tenders! Thanks Mari! I think most everyone likes chicken tenders one way or the other. My nieces like ranch on their pizza too, so this isn't the first I've heard of it. So I guess you aren't too weird hehe! My daughter and I like ranch for our tenders too. Now chicken wings...that's another story! Your chicken looks so crunchy and yummy! I hope I can get in on the tailgating soon! All of those dishes look fun to eat! I like your baked chicken tender, I'm afraid of frying anything in my kitchen because of the lingering heavy greasy odor. This is a great solution. Every dish looks good...I love the look of your chicken and sugar dogs by Krystal. These look great Lyndsey. I will have to think about making these. And they look easy too! What a fantastic collection of recipes! Hat's off to you and everyone. What a great idea. Thats too perfect and absolutely delicious! Festive season is on in my part and lots of guest visit almost everyday so I think this will go great with evening tea! Great! Yum collection of food! Thanks for dropping by!Have a nice day! My kind of chicken tenders. What a great idea. I just might have to dust off one of tailgating favorites. do visit mine..when ever time permits..
Just discovered your blog today. Love the healthier version of chicken. Looking forward to reading more. So tasty, ravenous after seeing your pics as usual! I am new to your blog and I love it! I have signed up to follow you and have also joined the party! I would be delighted if you joined me over at Create With Joy! Lyndz, I'm drooling here! The chicken looks so crispy delicious. Perfect finger food! All I need is some dipping sauce. These few days, my computer going slow! Just managed to get in. Will try to make the link after this. Have a great day. Annie, thanks for linking up! Rebecca, ha! Too funny! Thanks! Reeni, that's so nice, hope you can join us! Fresh Local and Best- I bake whatever I can, if I do fry it's usually in shallow oil in a skillet. Pru, they are so easy and you can make up a bunch and freeze the rest. alwayswinner786 - Oh, perfect with evening tea! ☺lani☺ - You're welcome, thank you too! Lazaro Cooks! - would love to have you join us! Jay - thanks! You know I love your site! Robyn - thanks and it is nice to meet you, glad you enjoyed my space here. The Paper Princess I am so you join me here! It is nice to meet you Ramona, I will definitly check out your place. Kristy - Yes I agree...gotta have a dipping sauce! I've had slow computer issues lately too! Frustrating isn't it? Happy you got a chance to pop in, and thanks for linking up to TT! These look perfect and the best thing they are healthy; I'm checking out your recipes; it's nice here. Sorry I haven been by, still dealing with mom, hospital and the latest - rehab. It's been a crazy time. Thanks for your comment offering your help. Can you come cook for us every night? Just kidding of course. I'll tell ya though, we've had to settle for fast food and take out more in these last two weeks than we've eaten in the last two years. Ick! This looks like a nice variation on a recipe we use a lot. I'm looking forward to trying it out! Rita - I often try to bake instead of frying food. It tastes good to us! Martha - You know I would make you dinner any time you asked! :D Hope things settle down for you and your family, my prayers are with you! Beth - I hope you enjoy them. I love using my stoneware because it browns things or crisps them with out having to turn them.